I love historical fiction, and I know some great YA historical fiction has been written since I was actively seeking out new YA some seven years ago or so. 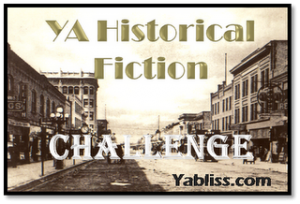 I am going to participate in the YA Historical Fiction Challenge hosted by YA Bliss. I won’t name titles right now because I might want to read some titles that have not yet been released. I’m wondering if I should put off reading The Ruby in the Smoke until January so I can count it? I do, after all, still need to read Mansfield Park for the Everything Austen Challenge this year. I also feel compelled to read it because it’s the only Austen novel I’ve never finished, and I know I’m being distracted by The Ruby in the Smoke. But we’ll see. I am definitely interested in suggestions if you have them. I have enjoyed Ann Rinaldi’s YA historical fiction in the past. I’m going to commit to level 3—15 YA books. By the way, in case anyone cares, my own book A Question of Honor counts for this challenge, and if I had published the other two novels I had written. I will definitely have to seriously consider joining this challenge. It looks like a really fun one, Stephanie. Why don't you?